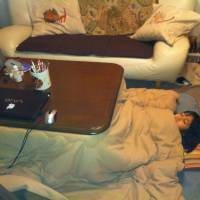 I’ll never forget my first winter in Japan when I heard that some Japanese people sleep under the kotatsu. The kotatsu, as you may know, is a small table with a heating element under it and a quilt that goes over the table (like a long tablecloth) to keep the heat in. Well, I thought it was a very strange thing to sleep under a table. I hadn’t physically been under a table since I was a child. As an adult, I just couldn’t see it. Until I realized how cold it gets in this country. Burrow? Heck yeah! Now I’m under the kotatsu table all the time and have relocated here for the entire winter. Send all correspondence to Amy Chavez, Under the Kotasu, Shiraishi Island, Japan. Or perhaps, like Shakespeare lived in Stratford-upon-Avon, my address could be Kotatsu-upon-Amy. But the kotatsu is, first and foremost, a low table to sit around Japanese-style, on the tatami mat floor. The idea is that your legs and lower body stay toasty warm under the quilt, while your upper body remains frozen. But this should not be too surprising because the Japanese have always shown favoritism to the middle and lower body. The idea that your lower body must be kept warm while the upper can fend for itself probably stems from the Japanese belief that your entire stomach and abdominal area are your body’s Command Central, where your moods, vitality and spirituality reside. Therefore, the most important thing for this area is to keep it warm. Funny, I thought it would have been to have six-pack abs. On the other hand, the Japanese may be onto something. Think about it. If you look at most people’s stomachs, there’s got to be something more than mere digestion going on in there. With the exception of young Japanese people who seem to have no stomachs at all, most people have big, roomy stomachs. As one of the bulgiest parts of the body, we’ve got to be housing something inside! Otherworldly beings? Maybe it’s one of those Japanese ancestor worship things — the ancestral spirits come back and take up residence in our stomachs. No wonder people give offerings of food and drink to the spirits. This idea is no further fetched than that of your dead relatives coming home between Aug. 14 and 16 every year for O-bon, guided by a special lamp you leave outside your door to alert them to the location of the domicile they lived in their entire lives. As if the spirits wouldn’t know where their ancestral home is. So I will go along with this idea that we need to keep the tummy warm. Which gets us back to sleeping under the kotatsu. I like sleeping under the kotatsu because not only is it warm, but it is located in the living room which is close to the kitchen, refrigerator, TV and toilet — all things you might need in the middle of the night. Want a glass of water? It’s right there. A midnight snack? Reach for the fridge. Can’t sleep? Watch some TV. I’ll never understand why houses like mine have the bedrooms upstairs, located as far away as possible from any conveniences, including the toilet. The closest thing to my bedroom is the stairway, a dangerous place to be for anyone getting up in the middle of the night. There’s another good reason to sleep under the kotatsu. 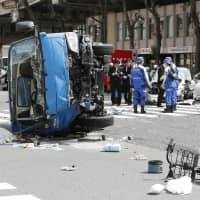 I’ll never understand why the Japanese do some this, but during the nighttime, the coldest eight hours of any day, is when most Japanese people turn their heaters off! But the exception here is — get ready for this — that it’s OK to leave the kotatsu on all night if you’re sleeping under it. Now, I’m not going to get into the subject of Japanese bias against certain heating appliances. Instead, in the name of the Japanese culture of suffering, we will gladly accept this loophole. How exactly does one sleep under a kotatsu? Glad you asked! The first time I had this experience was when I was visiting someone who lived in the mountains of Okayama. She laid down a futon for me on the tatami mat, along the length of the kotatsu, and another futon along the opposite side of the kotatsu for herself. We used the overhanging quilt on each side to cover ourselves. But I do not prefer this method because it only kept warm the side of the body next to the heat. The other half of my body felt like it was hanging off a sled being pulled by Huskies through the Arctic. I had to roll myself over every half hour to reheat each side. The thawing and unthawing process can be rough on your sleep. 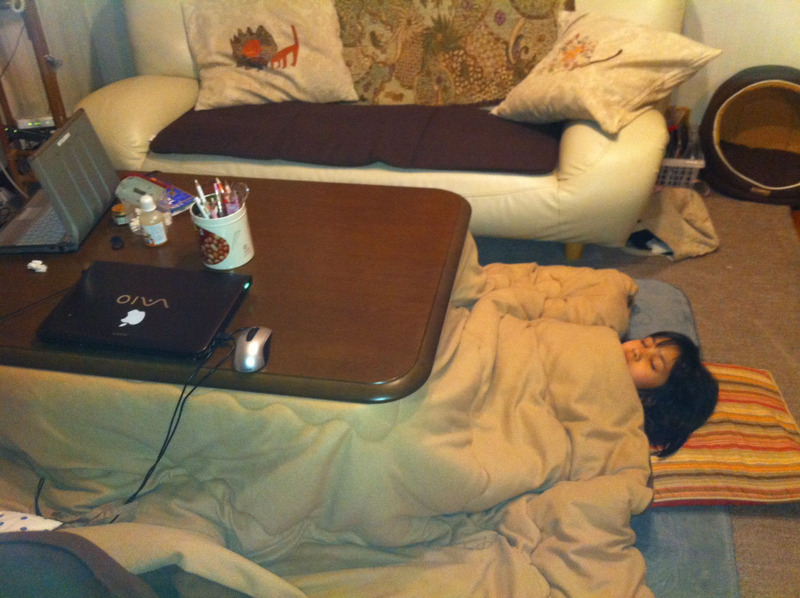 Instead, I recommend one of the three methods of sleeping under the kotatsu. You’ll need the following tools: hat, scarf, tissues and a pillow. Futon, optional. These methods are based on a standard of 80 percent body immersion. To do this, slide your legs in first as if you are just going to sit at the kotatsu. Then, slowly scoot your lower body further under all the way up to your hips. Then lie down, position the pillow under your head and pull the kotatsu quilt up to your neck. Now, you and your ancestors should be warm. Ahhhhhh. You may even notice that your toes are so happy, they start singing. 1. The slow roast: The slow roast has four positions: left side, right side, front and back. All night long, change positions by slowly rolling from your side to your back, onto the other side and then your stomach, just as if you were a piece of meat on a rotisserie. Even though you will have interrupted sleep, you will stay equally warm, and probably brown, on all sides. 2. The tropical beach: Put the kotatsu temperature up a bit past normal. Lay on your back as if you’re lying out in the sun. If it gets too hot, and it will, just turn over onto your stomach. While dreaming, order a tropical drink from the waiter. This position allows you to slide your hips a little further under the kotatsu. 3. The sizzler: Crank the temperature up higher than any Japanese person would ever dream of putting it. When your eyes feel dry, turn red and start to sting, you’ve achieved the sizzler. You’ll still need a hat and scarf to keep the head and neck warm since they never really get under the kotatsu — unless you crawl all the way under the table. But if you do this, I wouldn’t tell Japanese people. It’s bound to be considered “not good for the body.” Freezing the body, however, is OK.
Lastly, keep a box of tissues on top of the kotatsu table. You’re bound to get the sniffles. Follow Amy Chavez on Twitter @JapanLite.